This picture ledge is so understated, it's almost invisible. 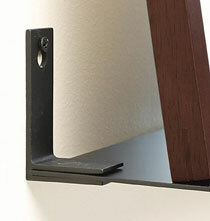 The Invisible Display Ledge is sleek metal, with just enough lip for your items to lean against. 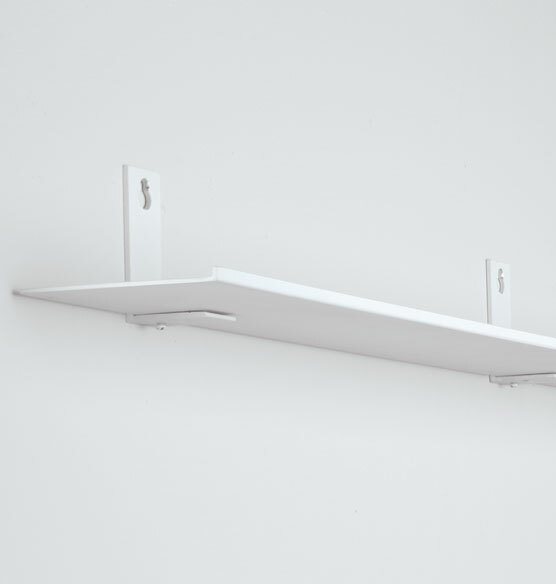 Connector brackets (sold separately) add stability and allow you to mount two or more invisible wall shelves in a continuous, seamless, symmetrical line. Available in two colors to coordinate with your wall and frames. The perfect ledge for a sleek and modern look!! Easy to install. I only wish there were size options ... 3" is a bit small and two together at 6" get's a bit long. However, they look great!!! I bought four of these to join together in a thin, long line about 10 years ago. They were the FIRST ledge/shelf option I found that would blend in with my modern more-or-less industrial decor. They joined together seamlessly, but you have to make sure you use the template and measure so they are level. That being said, they assemble easily. I used them for framed photos, dried flowers, small objects like ceramic pots, statues, etc. At first, anyway. Then I used them for framed book covers for a textbook I have a personal connection to. They held the weight very well. I disassembled them, wrapped them in packing paper, and shipped across the ocean to an island where they arrived and reassembled in fine shape. Whoever reviewed these and said the finish and paint comes off easily obviously didn't get the same product I did. Or perhaps they are just angry. I would recommend these to anyone desiring a non-traditional ledge option. Great for tight spaces...great looking. Very well made...very stable with the number of supports. Used for years and love them! As previous poster wrote, the brackets for this item are a problem. There's no need for them to be so large--ledges from other manufacturers aren't made like this and are just as sturdy. For this item, you'll need to arrange your artwork "just so" so the brackets aren't showing, because they are very noticeable. Now with them concealed, I like the ledges and esp. the aluminum color, but the bracket issue would make me look elsewhere next time. This product is misleading in its description. It is hardly invisible; the brackets show 3" about the shelf and are ugly. The picture of the shelves does not show the brackets. There are sticky tags all over, and when you wipe them clean, the paint washes off. The slightest nick with a fingernail results in chipped paint--most obvious with the black shelves. We already own 4 of them in black and they are great. Beautifully displays my family photos & more. I purchased two of the ledges, and they were perfect for display of framed pictures. I am ordering two more and connector pieces so that I can enlarge the display. I have 3 of the same ledges in my living room and I needed one more for additional pictures. The shelves don't take away from the pictures since they are so minimal. Thin profile will not distract from framed photos. I've purchased this before. It's built well and lasted for 10 yrs. It was exactly what my wife and I were looking for and could not find anywhere else. I have this. I wish the black was on sale. Very thin, not bulky. Has ledge to keep things from falling off. Can't see bulky hardware to hold shelf up. This is my 2nd order. Bought previously and works beautifully -- strong, functional, beautiful. Is black available in the invisible display ledge? BEST ANSWER: Thank you for your question. Unfortunately the black ledges have sold out. Since we no longer have inventory and are not expecting further shipments from the supplier the item was cancelled. We apologize for any inconvenience this has caused you. We hope this information will be of help to you. HOW LONG IS THE LEDGE? One image shows the brackets right at the end of the ledge. Another image shows the bracket mounted in a couple inches from the end of the ledge. I need to know if the bracket can actually be mounted inward a couple inches from the end so the picture I put on the shelf will hide the bracket ? BEST ANSWER: Thank you for your question. Yes, the brackets can be positioned any where on the ledge. We hope this information will be of help to you.